1980 was a year of change. The OPEC crunch of the 70s caused a disappearance of the 302 ci V8 and gave the Mustang a new 255 ci V8. This engine was a de-bored 302 and was the only V8 available in 80 and 81. The heads didn’t help the cause, and the result was a pathetic 119hp – earning the distinction of the slowest Mustang V8 engine ever. If that wasn’t enough to make Carroll Shelby toss cookies in his sleep – the lack of performance in this motor was further strangled by a 3-speed automatic transmission. Snore. The Turbo 4 Cylinder was the only ‘performance’ option for 1980. At 132hp, the Turbo engine topped the underwhelming 4.2L V8 in horsepower – but apparently that was an easier task than being reliable. The carbureted turbo four-cylinder was plagued with drivability and performance issues: Turbo lag, turbo failure, and poor turbo lubrication that would some times cause the turbo to ignite. Mustang was available as a Coupe in either standard or Ghia trim – and as a Hatchback in Sport, Ghia or Cobra trim. 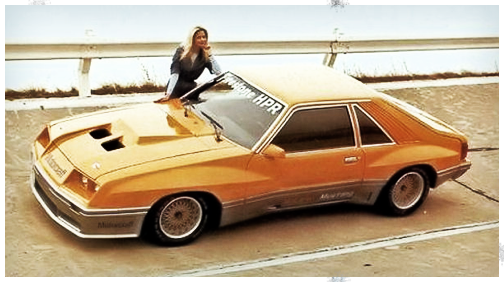 So, to recap – in 1980 the economy was crap, and America’s favorite pony car was sporting an anemic V8. Dark days were looming – until September. That’s when Ford announced the formation of a Special Vehicle Operations (SVO) division. The purpose of SVO was to “develop a series of limited-production performance cars and develop their image through motorsport.” This approach was not unique for the Mustang – special editions cars from the 60s and 70s like the Shelby, Mach and Boss had defined an image of performance for Ford. 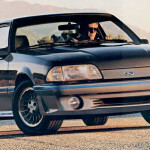 The birth of SVO would have a similar influence on the Mustang. * Car and Driver (1/80), 3-speed Automatic transmission. Location: Stamped on the plate which is riveted to the driver’s side of the dash, visible through windshield; the certification label is located on the rear face of the driver’s door. A new option for Mustang was the Carriage roof. Ford decided to offer this faux convertible-look three years before offering the Mustang in a convertible again. 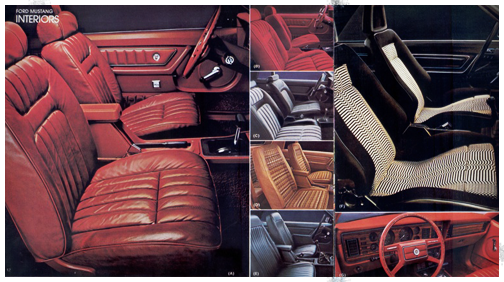 Select companies had been creating customized convertibles for the 1979 coupes. (Certainly the Carriage roof would be popular with the retired community of Boca-Del-Vista, Florida if it were offered on Mustangs today.) The Carriage roof coupes were prepared with blacked out window moldings. In 1980 the Cobra returned with a few noticable changes. Significantly, the Cobra was now available with a 135hp 4 cylinder turbo, or a 119hp V8, sigh. 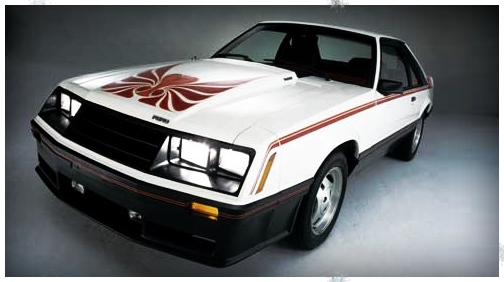 The ground effects package from the 1979 Pace Car was now standard on the 1980 Cobra, as were Marchal fog lights, and a rear-facing, non-functional hood scoop. 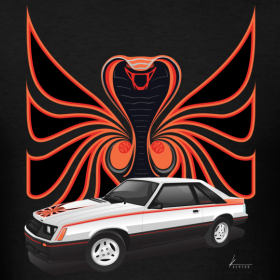 1980 Cobra T-shirt: $19.50 while supplies last. Click to select shirt color. Black quarter window louvres replaced the body colored versions of 1979, and a new graphics package appeared on the Cobra. The ‘Cobra’ decal was now on the quarter window, and a new striping package ran the length of the car – tying into a unique Cobra rear spoiler. The absolutely awesome graphics package was still available, this year as an $88 option. The Cobra package was $1,482. High-backed Recaro seats added another optional $531.00. 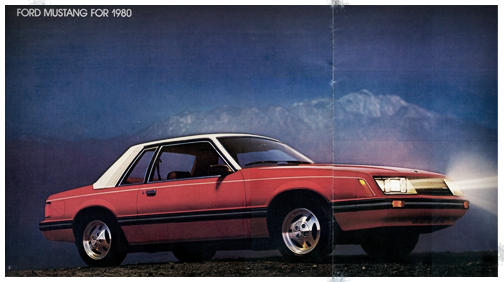 1980 saw the birth of one of the least understood, and possibly, most important Fox bodied Mustangs. A reorganization in Ford’s leadership sent Ford back to the race track with factory support. The McLaren M81 Mustang prototype was designed in the spring of 1980. This off-the-shelf, hand built specialty Mustang blazed a successful trail. 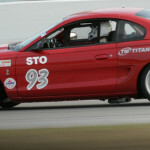 Many initiatives followed this prototype to bring Ford back to the race track, and innovative Mustangs to the street. For a complete summary of the M81 McLaren – check out our blog article: History of the M81 McLaren Mustang.